While the KeyRack Steel might not change your entire life, it is sure to make the key parts of it a lot less complicated. Constructed of high quality stainless steel, the rack features a sturdy, secure carabiner gate closure that allows you to clip your keys onto and off of belt loops, zipper pulls, purse straps, second key rings-anything with a loop or D-ring. The bottom half is a solid loop that holds six #.5 sized Stainless Steel S-Biners that attach and release on either end to keep your keys securely and conveniently organized. Perfect for quick and easy sharing of keys with valets, mechanics, family members and babysitters, the easy on/off feature of these S-Biners also make it a cinch to take a single key from the rack when you're heading out for a run or ride. You will love your new, split-ring free life. We promise. KeyRack Steel While the KeyRack Steel might not change your entire life, it is sure to make the key parts of it a lot less complicated. Constructed of high quality stainless steel, the rack features a sturdy, secure carabiner gate closure that allows you to clip your keys onto and off of belt loops, zipper pulls, purse straps, second key rings-anything with a loop or D-ring. The bottom half is a solid loop that holds six #.5 sized Stainless Steel S-Biners that attach and release on either end to keep your keys securely and conveniently organized. 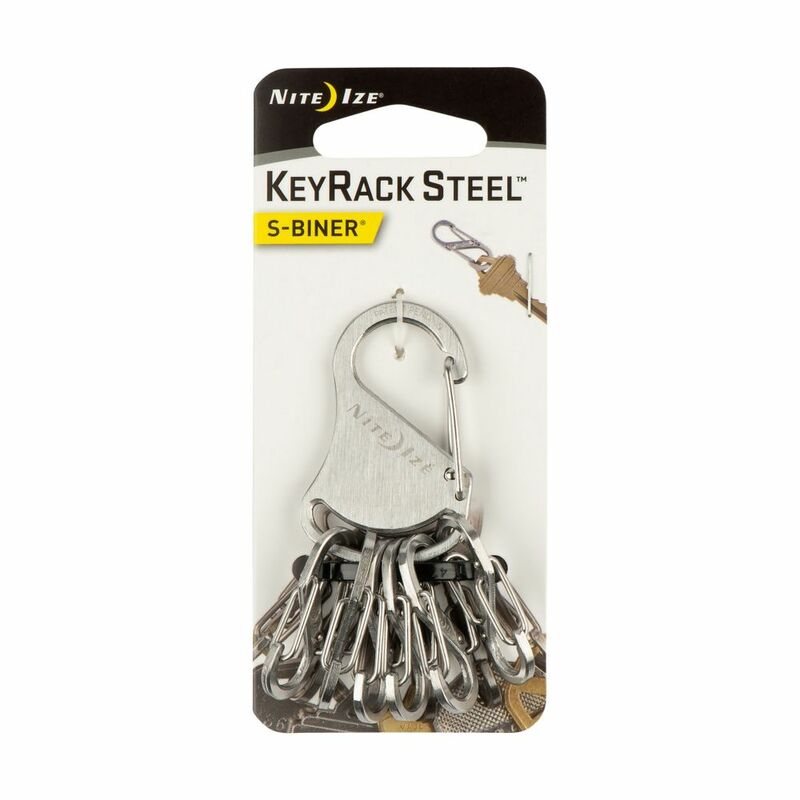 Perfect for quick and easy sharing of keys with valets, mechanics, family members and babysitters, the easy on/off feature of these S-Biners also make it a cinch to take a single key from the rack when you're heading out for a run or ride. You will love your new, split-ring free life. We promise. KeyRack Steel is rated 3.7 out of 5 by 17. Rated 5 out of 5 by CAM from I bought this for a “non-key” use of two of... I bought this for a “non-key” use of two of the smaller S hooks. I purchased a link chain that I needed to arlttach to the rubber drain stopper (with its attached ring) for my new Mustee utility sink...and other end of chain would attach on back wall. This to help keep track of the OEM stopper which is more substantial than its aftermarket replacements of same diameter. So I placed 2 of the smaller S hooks at the ends of the chain, attached stopper to terminus end, secured the other end...and I have what I wanted and needed! Not sure yet how I’ll use the rest of this item but I’ll think of something. Maybe keys related, maybe not! Rated 5 out of 5 by Pancho2011 from I bought this because I was tired of having to turn off my car to get my house key off.. this is ... I bought this because I was tired of having to turn off my car to get my house key off.. this is awesome I can just remove the key I need to remove and keep the rest on there. I like that each individual clip has a little notch on it as an added feature to ensure the keys do not come off easy. Rated 5 out of 5 by Allan from Very nicely made, as usual for the Nite Ize product... Very nicely made, as usual for the Nite Ize product line. Rated 5 out of 5 by HomeDepotCustomer from I purchased this for the individual S clips. They are... I purchased this for the individual S clips. They are the perfect size to use to attach the tags to a dog’s collar. They are small and durable. It is quick and easy to change out tags(rabies, county license, etc.) for current ones. No more broken fingernails as with slip rings.